Sharooz: a man of many sampling talents. DJ, producer and sound designer Sharooz is no stranger to sampling. Having produced a glut of sample-heavy floorfillers over the last five years, he's also an in-demand remixer. He's tackled the tracks of a diverse range of acts, from Moby and Robyn to Kings of Leon and Howard Jones. Weaving between the genres of electro and tech-house, Sharooz also splices elements of disco and indie dance into his productions. Here, he offers up some inspirational tips for anyone who wants to get creative with their sampler. Remember those warped vocal effects that were popular in the late '90s? (No? Grab yourself some old UK garage records.) There seems to be a renaissance of garbled vocals in clubland these days, particularly in dubstep and electro. Simply take your vocal line (or a portion of it) and timestretch it down around 100 - 200% using the roughest algorithm you can find - make sure you try different presets to get the desired effect. For best results, try to use an algorithm close to the seminal Akai S-3000 sampler, which was the unit used on most records of the time. Take a short hit such as a lead or organ sound and set a synced LFO on the end. 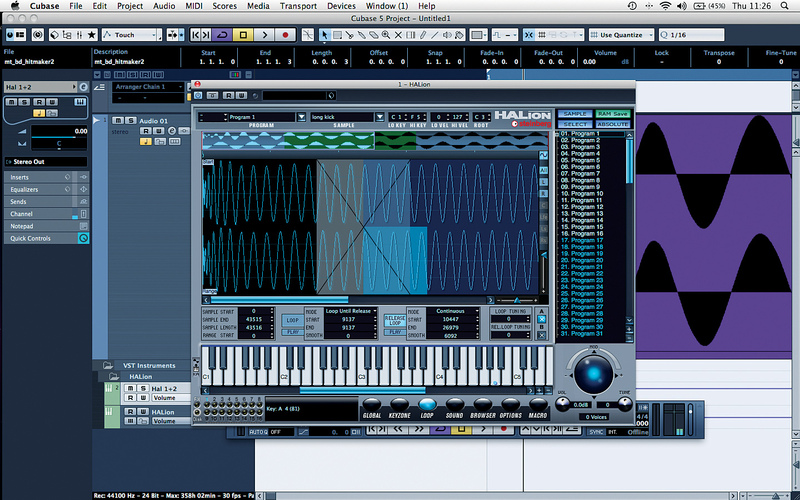 Now, add some pitchbend automation (around three semitones) at the end. Your multisampled hit riff just got a whole lot more inspiring! Try recording a sampled loop played back from one device into another at a very low volume, then normalise it in your audio editor. The end result will include all kinds of gritty, glitchy digital noise and spill. The more lo-fi the playback device, the more mashed-up the end result - old keyboard-based samplers or your vintage PC soundcard are ideal. Take a combination of musical or bass loops or hits in the same key and layer them across the keys of your soft sampler, one to a key, then play back at random to create a bassline or melody from multiple hits. Route each sound to the same output with the same effects processing or compression to ensure that all your sounds fit into the mix. Achieve instant stereo separation by taking the same sample and putting it on two separate channels, panning one hard left and the other hard right. Move one sample slightly ahead of the other (we're talking milliseconds here), then trigger and play back the sound for instant stereo width separation. You can also tweak the delay time for even greater stereophonic width. Ever fancied being a virtuoso guitarist or saxophonist, but struggled to get past the opening strains of a nursery rhyme? Just make your own multisampled instrument! Try recording the six open strings of a guitar, cleanly plucked at, say, three different velocities. Put each one into your audio editor and fade them down so they are the same length, then stretch them across the keys, covering an even number of tones with each sample. The crudeness of this technique can be surprisingly inspiring, especially when the sounds are blended with a software equivalent of the real thing. Looping a random section of any sample indefinitely can produce fantastic results. 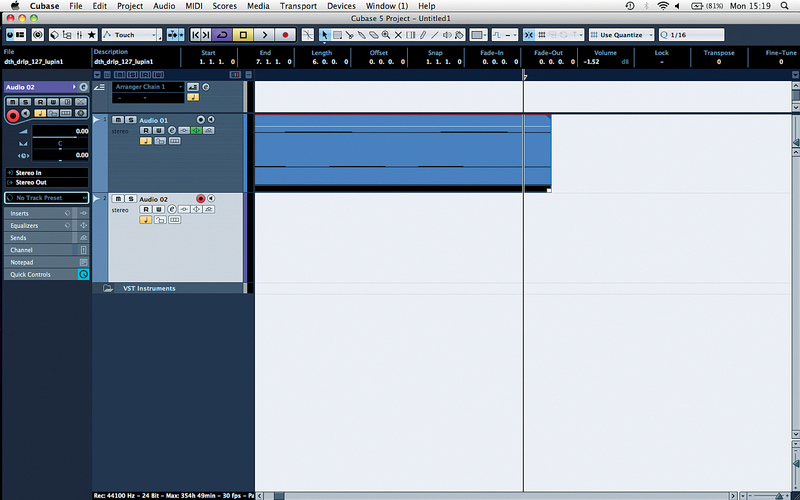 You can use a DAW to pick out parts of a sound and lengthen them manually, but a soft sampler can do the same job. Using a plug-in such as HALion you can actually set a 'smoothing' parameter to automatically crossfade between sections, allowing you to loop virtually any part of a sample without any hassle. In the screenshot above I've created a never-ending bass tone by looping the middle of the sound and crossfading so there are no clicks or pops. You can even adjust the tuning of the looped section to give a more unique effect, so the sample fades into a detuned section. 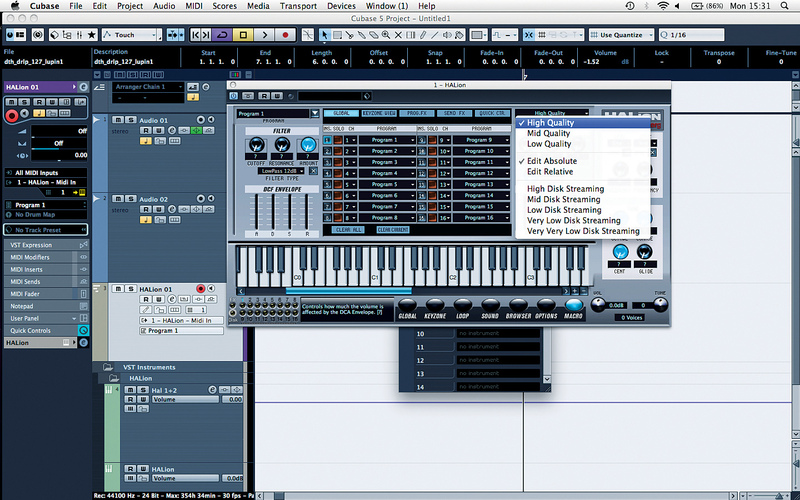 Try looping and detuning various sections to create monstrous bass! Nowadays you'll hear a lot of enthusiastic talk about the classic, punchy sound of vintage hardware samplers such as the E-MU SP1200 and the Akai MPC-60. A great deal of the crowd-pleasing sonic character that these devices provide is down to their 12-bit/40kHz sampling rate. Happily, it's a fairly simple matter to recreate this effect using plug-ins - just resample your beats and loops at 40kHz and run a bitcrusher across the sample. The 40kHz sampling rate on the old hardware samplers usually removed the extreme highs and lows in a sound, so experiment with EQ or even export a beat as a 128kB/s MP3 and import it back into a project to replicate this effect. Take a loop and automatically locate its transients, cutting up each slice. Now spread the slices across the pads of a drum sampler. You can then play back the loop slice by slice at a variety of tempos, resequenced and with each slice routed to a separate output for individual processing. This technique has been a stable of hip-hop production for years, and it's always good, clean fun to play around with. Rather than slicing them outright, you can also try spreading your loops across the keys of a soft sampler, using a different transient on each key. For example, have the original loop on C1, then have the next transient - a hi-hat, say - on D1, the next - a snare, maybe - on E1 and so on. Try pitching down alternate keys or routing to different outputs for added weirdness. Make sure not to trigger each sample as a one-shot, though - otherwise you'll have numerous variations of the same loop bunching on top of each other and your efforts will sound like feeding time at the zoo. When using a software sampler, always make sure to crank the sound quality control right up to the highest possible setting. After all, there's no sense in loading 24-bit samples if your sampler isn't equipped to deal with them. As obvious as this advice might seem to you, our seasoned and tech-savvy reader, you'd be surprised how many devices still default to the Medium quality setting to save on processing power, so it's always worth checking. Make sure the loops and sounds that you're using are sample-accurate. Many conscientious manufacturers will have already done this for you, but if yours hasn't, zoom into the end of a loop as far as you can and check that it ends exactly on the bar line and doesn't overlap. If it does overlap, it can cause problems when looped or layered with other sounds. The start point should be exactly at the start of the bar too, and should not include any unexpected silence. Another basic but essential step in preparing your sounds is to make sure that they are all key- and tempo-labelled. It's amazing how easily this piece of house-keeping can be overlooked, even by production veterans. Ensuring that your sounds are sensibly categorised will save you plenty of time in the future and will increase productivity no end when you're mixing and matching loops. Once again, the more user-conscious sample labels will helpfully always do this for you. One fiendishly clever way to tighten up a loop is to apply a volume envelope to each slice. First, break the loop up into its constituent parts and load them into your soft sampler. Now adjust the Decay in your ADSR settings and apply this across all slices. Your loose, baggy loop has now become a short, tight and snappy beat! This technique is also perfect for removing room ambience or truncating long reverb or decay tails from snares and other hits. Don't be afraid to experiment with other settings, too. Adjust the attack on hi-hats to bring out the kicks and snares, adding more punch to a groove. 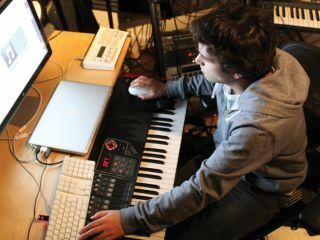 Keep some hits short and others long to re-adjust the entire feel of a loop, or try timestretching some slices and leaving others unaffected. In all, this can be much more useful than a traditional noise gate. For a comprehensive selection of sampling tutorials and techniques, check out the Computer Music Sampling Special (issue 48) which is on sale now.